Mayor Durkan released her budget proposal for 2019-20 on Monday. The first budget hearing is coming up fast on Thurs, Oct 4th (next week!) so we wanted you to know right away how her proposal measures up to SHSC’s 2019-20 Budget Recommendation Portfolio. The bottom line is that the Mayor’s proposed 2019-20 budget does not even maintain the level of services currently provided and makes NONE of the additional investments needed to see the changes Seattle residents and businesses want in our communities, as urged by SHSC members in the recommendation portfolio. There are three major areas City Council members must address in order to achieve the basic priority of no cuts to current levels of community-based health and human services. The mayor’s proposed 2019-20 budget will actually cut 217 overnight shelter beds plus space for over 50 people temporarily accommodated in “little houses” in the first 6 months of 2019. This capacity must be restored. The mayor also only includes half of the funding for inflation adjustments needed to provide the same level of services with costs increasing and only on some city contracts. $18million more is needed just to account for 3.5% inflation and preserve current services. The Mayor’s proposal also cuts funding for grass roots advocacy to bring state resources to Seattle residents, which is more critical than ever. Just $88,000 in 2019 and $91,000 in 2020 will restore this work. The mayor’s proposed budget doesn’t even allow us to tread water! Invest in solutions at the scale of the challenges our communities are facing. We will only get a better budget if you MAKE YOUR VOICE HEARD! The ball is now in the Seattle City Council’s “court” and they will decide on the City’s 2019-20 budget in the next seven weeks. —both hearings are at 5:30pm at City Hall in Council Chambers, 2nd floor Seattle City Hall, 600 Fourth Avenue, 98104. You can make a difference by giving testimony at the hearings or just come and bring your friends to the hearing; we'll have RED scarves you can wear to show your support for human services funding. Sign-in to testify usually starts at 4:30 or 5pm. Because many people come to the hearings, if you want to testify, but don’t want to stay too late, you may want to arrive as early as 3pm in order to secure an earlier speaking time, but they will keep the hearing open until everyone who wants to testify has done so. What would it help to say? Always start with your support of SHSC’s full portfolio or recommendations, then talk about the portion that you want to bring to their attention, or why the full package is important. We support SHSC's 2019-20 budget recommendations to move us toward becoming a just and thriving community and we urge you to fund the full portfolio. Find the complete messages here. Find tips and pointers on how the hearings work here. If you know folks who can't make it to the hearing, they can contact Councilmembers directly before October 25th. Sooner is always better! At City Hall you can park in the SeaPark garage ½ block up Cherry St from City Hall for $5 after 4pm if you let them know you were at the public hearing. (If you park before 4pm, the regular rate will apply up until 4pm). Council Chambers is ADA accessible, with an Induction Loop assistive listening system. To arrange for accommodations, contact customer support at (206) 684-8888; or TTY Relay 7-1-1; or visit http://seattle.gov/cityclerk/accommodations. For more information, contact the Seattle Human Services Coalition, 206/325-7105, leave a message and we’ll return your call, or email jsterkovsky@shscoalition.org. Your concerted advocacy resulted in an increased investment in 2018 of $9,850,942 for community health and human services and efforts to move us closer to becoming a just and thriving community. (See the full list of adds here). This is in addition to the $4,546,853 for 2018 we gained in 2016. Advocacy works and you do a great job of it! Mayor Burgess released his budget proposal for 2018 on Monday. The first budget hearing is coming up fast on Thurs, Oct 5th (next week!) so we wanted you to know right away how his proposal measures up to SHSC’s 2018 Budget Recommendation Portfolio. The bottom line is that while the Mayor has proposed some new investments, including two from our portfolio, there is much more than can and should be done. The increase in homelessness investments he has proposed, for example, is just 3%. If our top priority as a city is to make Seattle a Just and Thriving Community, City Council must bring the City’s investment in solutions up to the scale of our challenges! It will only happen if you MAKE YOUR VOICE HEARD! The ball is now in the Seattle City Council’s “court” and they will decide on the City’s 2018 budget in the next seven weeks. —both at 5:30pm at City Hall in Council Chambers, 2nd floor Seattle City Hall, 600 Fourth Avenue, 98104. You can make a difference by giving a 2-minute testimony at the hearings or just come and bring your friends to the hearing; we'll have RED scarves you can wear to show your support for human services funding. Sign-in to testify usually starts at 4:30 or 5pm. Because many people come to the hearings, if you want to testify, but don’t want to stay too late, you may want to arrive as early as 3:30pm in order to secure an earlier speaking time, but they will keep the hearing open until everyone who wants to testify has done so. Always start with your support of SHSC’s full package, then talk about the portion that you want to bring to their attention, or why the full package is important. We support SHSC's 2018 budget recommendations to move us toward becoming a just and thriving community and we urge you to fund the full package. We appreciate the City's ongoing actions in sustaining community health and human services AND in the face of rising income inequality and increasing racial disproportionality, it is time to do more. We need to bring the City’s investment in solutions up to the scale of the challenges our communities are facing. All Seattle residents want to live in a just and thriving community and as our city councilmembers, your leadership is needed to direct public investments to do that. Each recommendation in the portfolio has been analyzed through the City's own Race and Social Justice Toolkit. Real people don't live in silos. The recommendations in the Portfolio have been created to cross "silos" for maximum impact and effectiveness. If you know folks who can't make it to the hearing, they can contact Councilmembers directly before November 1st. Sooner is always better! The ninth councilmember will be appointed on October 6th to replace former councilmember Tim Burgess who is now mayor. Do You Have Questions About Immigrant Rights, human services, and sanctuary? Here are some of the common questions providers have raised with links to the answers and further resources. Our thanks to the Northwest Immigrant Rights Project (NWIRP) for providing much of this resource info and for the vital, effective work they do! Thanks to SHSC’s new Operations Administrator, Kimberly Alfonzo Chae, for her work tracking down many of the answers. For answers to these questions and more, go to SHSC’s Resource Page on sanctuary and human services. More info on advocacy opportunities upcoming! Congratulations to everyone who advocated for more funding to help Seattle residents meet their basic human needs in 2016. Mayor Murray and Councilmembers added a record $17,382,286 to the endorsed 2016 budget for services and structures to address a wide variety of issues across our communities. At the same time the Mayor and Councilmembers cut the 2016 inflation adjustment for all HSD contracts to below the rate of inflation for service delivery AND failed to step up to the challenge of effectively mitigating the upcoming impacts of the rising minimum wage on human services, which goes up another step on January 1st. Your hard work paid off in many areas for our communities. Our appreciation also goes out to the SHSC leaders who served on SHSC’s City Budget Task Force this year. Advocacy works! City Councilmembers will be making all their budget decisions in the next few days. Come to City Council Chambers Monday morning, November 16th, starting at 10 am and be a witness in a red scarf as the Budget Committee takes their votes on all adds and cuts. 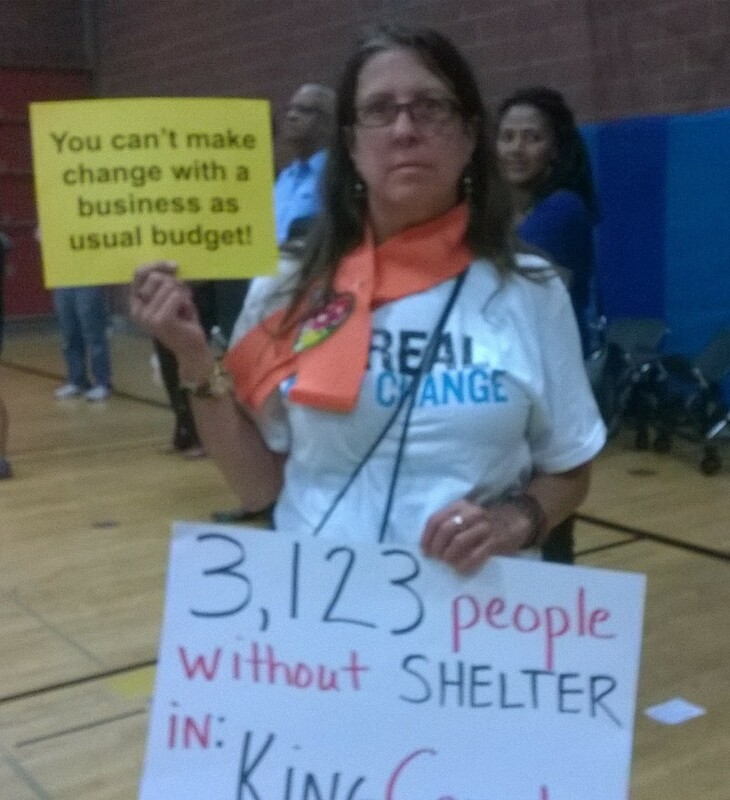 MAYOR AND KING COUNTY EXECUTIVE DECLARE STATE OF EMERGENCY ON HOMELESSNESS, ADVOCACY NEEDED TO CITY COUNCIL NOW! SHSC's letter to Seattle City Council Members concerning the state of emergency urges further action needed for making a rapid and noticeable difference. Contact Council now to support these actions. SHSC recommends immediate implementation of Phased Mitigation Plan. KEEPING UP WITH THE CITY BUDGET? THE STUDENTS AT CENTER SCHOOL ARE. Listen to the Public Service Announcements they made. Read Center School students' guest column, "Health, Human Services Deserve More Funding," in Queen Anne & Magnolia News. For more information about SHSC's budget recommendations, visit our Actions & Opportunities page. 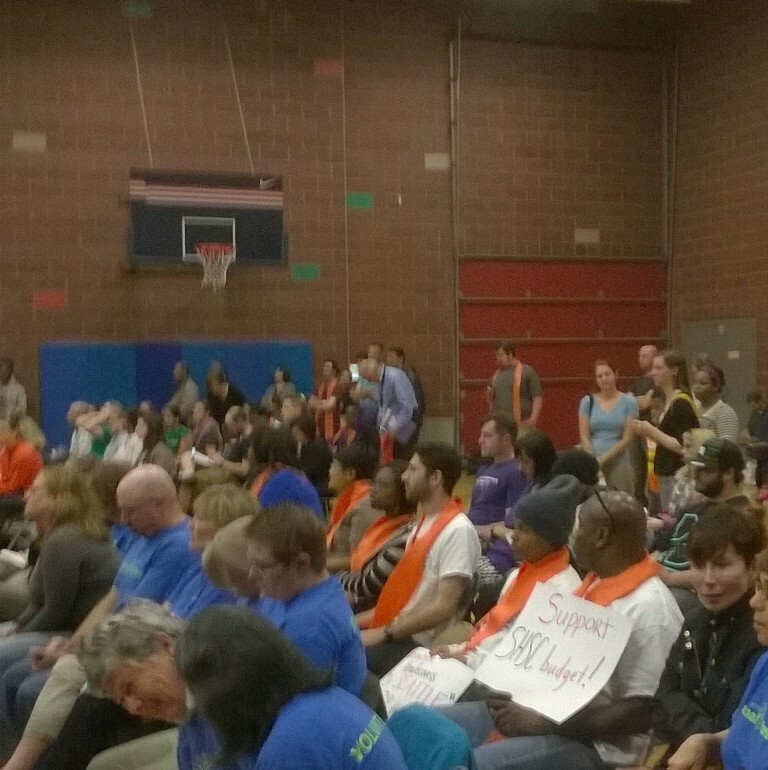 Did you know Mayor Murray has proposed a cut to all City HSD contracts, including yours? Are needs increasing in your communities? What funding is necessary to make sure the rising minimum wage does not result in cuts to human services? The Seattle City Council is making 2016 budget decisions in the next four weeks. There is only one public hearing remaining: Tuesday, Oct 20th, 5:30pm at City Hall. Although the economy is reported to be recovering, this economy is also falling short for at least half of the people of Seattle. More and more people continue to come to us for help. not proposing enough funding to make up for increased costs due to rising minimum wage. Both of these will result in cuts to services starting in 2016. AND a 50% cut in human services advocacy work at the state level that benefits Seattle residents. His proposal does include incremental funding increases in some areas, but not enough investment to address the state of emergency in our communities right now and not enough to see the change we all want in our communities. See the full SHSC budget recommendation package for a Just and Thriving Community for more details, including proposed investments from SHSC's recommendation package and other proposed investments SHSC supports. Good News: Your voice counts! Whether our inflationary adjustment is restored, minimum wage is mitigated, or the recommended investments in SHSC's package are added depends on if you demonstrate community support for these investments. The last budget hearing is Tuesday, October 20th. Give a 2 min. testimony at the public hearings or just come to the hearing; we'll have RED scarves you can wear to show your support. Find more information on messaging here. Tuesday, October 20th at Council Chambers, 2nd floor Seattle City Hall, 600 Fourth Avenue, 98104, 5 pm sign-in, 5:30 pm hearing begins. 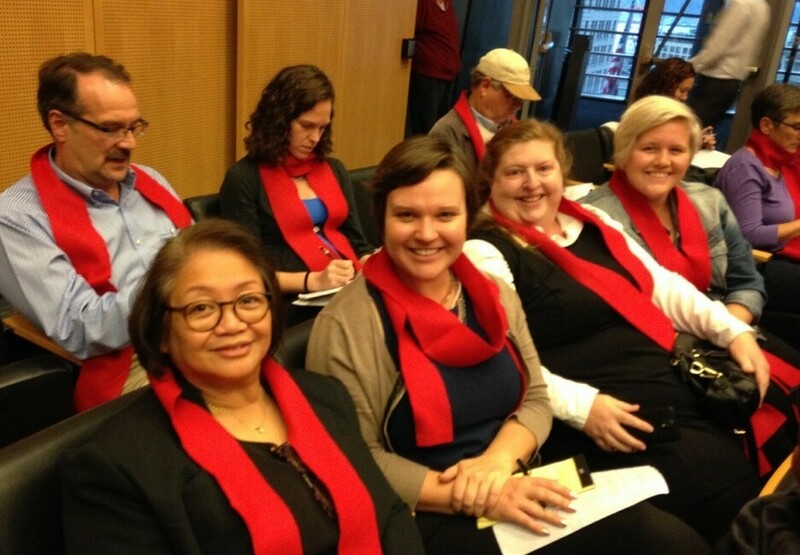 Supporters of SHSC's Budget Recommendation Package wear red scarves signifying their support. Take action on the campaign! Sign-up and we'll call on you for things like phone banking, yard signs, etc. After ten years working towards it, we now have a dedicated , adequate, stable revenue source for regional community health and human services on the November ballot: Best Starts for Kids! This will mean $60m each year for support kids need to fully develop their potential, including solutions to address domestic violence, hunger, and homelessness. Do your constituents have an interest in good systems to prevent wage theft? The City of Seattle is engaged in a process to iron out the rules needed to enact the Wage Theft Ordinance. It is still being shaped right now. If you have an interest in how this looks, act now. On Human Rights Day, December 10, 2014, the Seattle Human Rights Commission awarded the Seattle Human Services Coalition the Coalition Human Rights Leader award. SHSC co-chair, Patricia Hayden, accepted the award on behalf of SHSC. 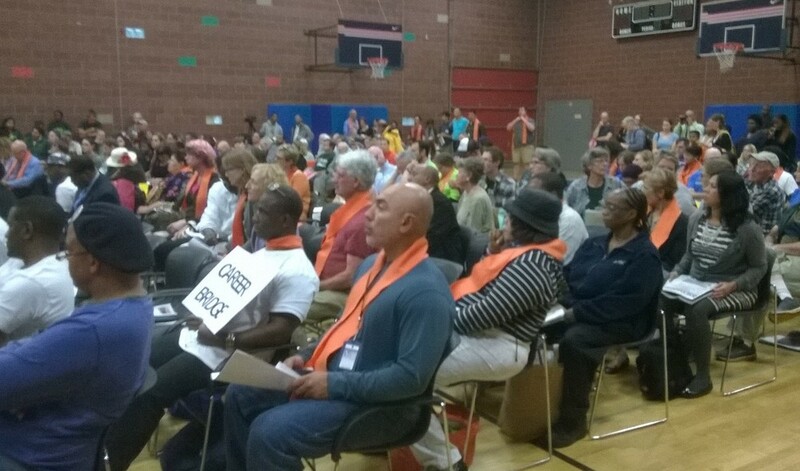 The many advocates of SHSC's 2015-16 Budget Recommendations Package wore orange scarves to show their support for the package at the October 7th City Budget Hearings. See more pictures. SHSC Co-Chair, Patricia Hayden delivered SHSC's testimony at the October 7th, City Budget Hearings at Garfield Community Center. Read SHSC's message. SHSC leadership reminds City Council and Mayor Murray that a comprehensive study and plan are needed to prevent cuts in human services for Seattle residents due to new minimum wage policy. See complete set of the actions recommended here. Pictured in the banner above: the SHSC team who presented the budget rec package to Mayor Murray; City Budget Task Force Co-Chairs Johnny Otto and Julia Ismael, holding the package in the front row surrounded by experts in community health and human services, Alison Alfonzo Pence, MJ Kiser, Deeann Puffert, Regent Brown, Merril Cousin, Mark Secord, Julia Sterkovsky, SHSC Co-Chairs Steve Daschle and Patricia Hayden, and Jessica Werner. SHSC representatives presented Mayor Murray with the SHSC’s package of 2015-16 City of Seattle Budget Recommendations for a Just and Thriving Community in August and met with each member of City Council in September. The 2015-16 package has a new central organizing question, one we heard many city councilmembers ask us last fall: “What would it take to move the needle?” That is, what are the actions needed in order to see positive changes in our communities.This package was also developed in a new way. We focused on reducing racial disproportionality in outcomes and reducing the negative effects of the artificial silos of services into which the system has traditionally been organized. Get a complete copy. access to adequate resources. Learn more. SHSC's "selfie" with Mayor Murray. Having an adequate supply of housing in Seattle that is affordable to people of all incomes is integral to strong, healthy communities. The Seattle Human Services Coalition has added our voice to a collaborative effort to strengthen the incentives for developers in Seattle to include affordable housing in their projects. We urge you to sign the Growing Together Coalition petition and we urge your organization to endorse stronger incentives. Sign the Petition.